For some people I guess all running is the same but for me and some others there are different types of running. Any kind is good but they all serve different purposes and sometimes the three main types get a little mixed up. For me over the past couple of years it seems I've done a lot of just running and that is not a bad thing. I had to get over the injuries so some days I was happy to just get out and put in a few miles. Sometimes when I'm running in a race I'm not really racing but just running. That happens a lot when I don't have a time goal and decide to just enter an event for fun or when I decide to run with someone else. Usually thats with Karla but occasionally others. Sometimes its planned from the start but sometimes I happen to pull alongside someone and decide to stick with them. 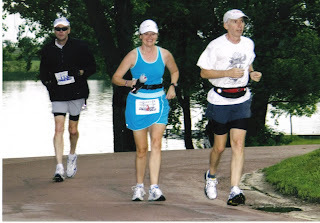 Just running can be a lot of fun especially when it is shared with someone. When I'm alone I describe just running as going out everday at about the same pace. A little slower on days when I don't feel so good and a little faster on others when I feel better or the weather is nice. And although I call it just running , any miles are a form of training. But real training to me is what I have been doing the past few months. That's when I have a set goal, develop a plan to achieve that goal and then go out and execute the workouts to make the goal a reality. Each day that I head out the door has a purpose, to either build endurance , stamina, speed or to recover. I get excited about nearly every workout and look forward to getting it done. I love to track my progress and analyze the results and to occasionally check my progress to see if I need to make adjustments in the plan. Right now I am loving meeting Karla at the track every Tuesday and devising a speed or stamina workout. I usually do some shorter, faster paced stuff while I wait for her and then run another one with her. I love the sensation of moving at a fast pace, feeling the burn in my legs and lungs but knowing that it will pay off come race day. It is wonderful to feel the zip, the power returning to my legs. I can't hardly wait for Saturday mornings to come around so I can go for a long run at Umstead or Shelly Lake Greenway with the Marathon Princess and Mountain Girl and occasionally the Ultra Angel. And I look forward to Thursdays when I can go out by myself and push myself hard on a tempo run or mile repeats on the country roads of home. Which brings me to racing or the icing on the cake of all the training. There is nothing like the feeling of laying all out and pushing to your limit when your in shape and know the training is going well. Although I will never realisticly approach the pr 's in the shorter distances that I set over 20 years ago I still enjoy seeing just how fast I can push myself and come as close to those paces as possible. And you may think I"m crazy but I feel with my current training plan that I have a legitimate shot at setting pr's from the half-marathon on up to 100 miles over the next couple of years and will be working towards a goal of doing that. But, while I focus in that direction, I plan to do a lot of just running too with my regular training partners Karla, Lisa , Jenn and maybe you. Hey Joey, NC is the fountain of youth. Since moving here five years ago I've set PRs at these race distances: 6k, 9m, 14m, 15m, 20m, 30k, 35k, 50k, and 36m. I'm only slow on the standard courses: 5k, 10k, 26.2m, etc.